While in Seattle on the recommendation of family I took the Seattle Free Walking Tour’s Seattle 101 tour. If you are visiting I highly recommend this as our guide Jake took us on a 2 hour walk filling us in on history of Seattle and some of his favorite spots for food and photos. He also reveals many hidden gems of things to see or do in the city. As implied by its name the tour has no cost and at the end you pay only what you feel or can. While the tour is free they do ask you make a reservation. 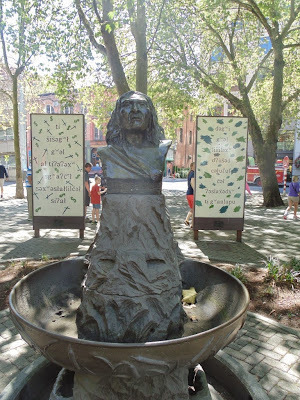 Here is one of the stops in Pioneer Square at the Chief Seattle (Si’ahi). He was a prominent figure among his people and pursued a path of accommodation to the white settlers instead of war. The city of Seattle is named after him. You can learn more about Chief Seattle and the Squamish tribe here. This entry was posted on Tuesday, August 26th, 2014 at 12:36 am	and is filed under Feature, Art, Hawaii Photo of the Day, Attractions. You can follow any responses to this entry through the RSS 2.0 feed. You can leave a response, or trackback from your own site.